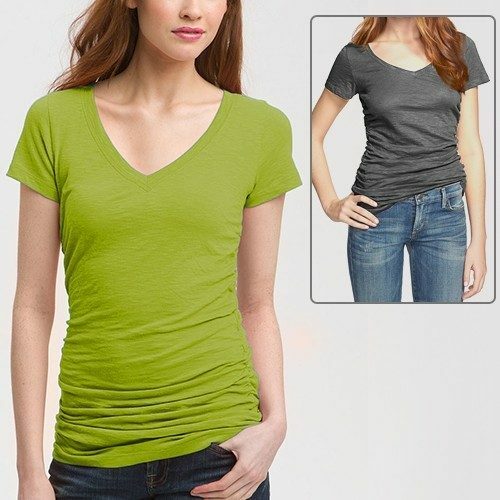 Short Sleeve, Side Shirred V-Neck Tee Only $5 Plus FREE Shipping! You are here: Home / Great Deals / Short Sleeve, Side Shirred V-Neck Tee Only $5 Plus FREE Shipping! With the warm season fast approaching keep cool with the Wet Seal Ladies Short Sleeve Shirred Side V-Neck T-Shirt for only $5 plus FREE Shipping! These shirts come in two colors; a stark green and a modest grey can meet any formal or casual social function. Great for layering or worn alone this V-neck t-shirt is the perfect flattering touch for any ensemble!